You know how clean and empty the lower level of the church looked on Sunday? It doesn’t look like that now. This week has been excavation week. The construction crew has been digging up the floor of the lower level of the church. 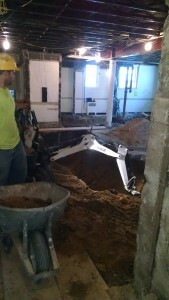 The bathroom floors have been excavated to take out the old plumbing and put in new plumbing. The hallway floor is being excavated to make room for the elevator to go all the way down to the Great Hall level (the elevator will have two stops on the lower level: one at the Meeting Room level and one at the Great Hall level). Excavation is going well, with no big ledges or boulders discovered so far. Just lots of dirt, which is being taken out by wheelbarrow. 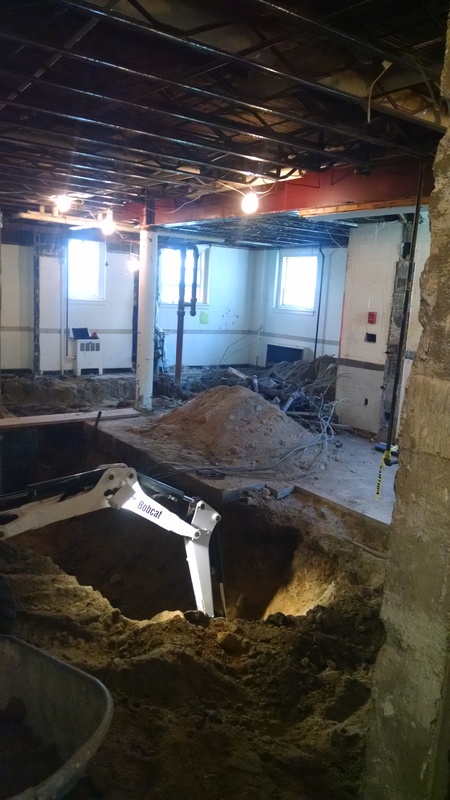 Towards the back, you can see where the bathrooms have been excavated. The big pile of stuff in the back right is old plumbing. A big hole where the elevator is going to go. 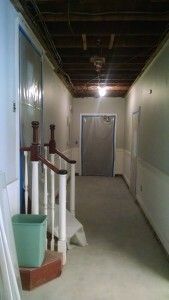 Upstairs, things have been sealed up to keep dust out of the church.